MarketSaw - 3D Movies, Gaming and Technology: JURASSIC WORLD Shatters Global And Domestic Best Openings Of All Time! 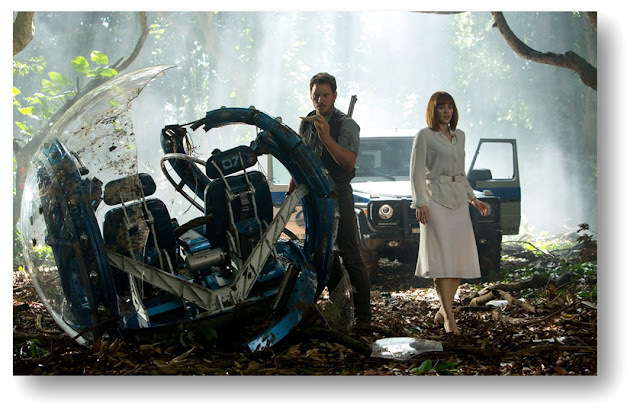 JURASSIC WORLD Shatters Global And Domestic Best Openings Of All Time! JURASSIC WORLD was grossly underestimated for it's opening weekend, probably by many of the critics who decided to write negatively about it. Personally I knew it would do much better than the estimates - even the studio pegged it at $100m domestically. But I was off too - this movie is a phenomenon. This thing's a monster itself. JW captured the domestic opening weekend record by biting into a $208.8m opening topping the previous record holder THE AVENGERS ($207.1) from 2012. It would have been higher too, but it was competing with NBA and NHL finals taking place. Internationally, box offices were swallowed whole. An all time record of $315.3 million topping HARRY POTTER AND THE DEATHLY HALLOWS PT. 2 ($314m). And a stunning $524.1 million - over half a BILLION dollars in one weekend in total worldwide box office. Think about that. JW also topped THE AVENGERS for the all time record in the revenue per theater with a whopping $47.8k in 4,274 locations. Over 50% of the box office take was driven by 3D screenings which is obviously a huge amount of revenue. I'm very impressed with the numbers driven here by 3D - especially in the large premium formats. When there is a record breaker like this - all bets are off. Word of mouth can do massive, sustained business with many repeat viewers in the mix. A solid "A" Cinema Score, 52% male / 48% female audience with 39% below the age of 25, an excellent 3D conversion means this thing WILL have legs. Will it reach TITANIC levels? (2.187b) It's conceivable but we do have some big openings coming up. TED 2 is next weekend and TERMINATOR: GENISYS is July 1 - but it is more or less clear sailing for JW until June 26. Obviously lots of money to be made in between. I'll be seeing the movie again in the coming week and will have my review out shortly for the 3D side of things - but trust me, it looks great! If you haven't seen it yet - get out and see it! !